Today I realize my shoe-a-holism has gotten a bit out of control. I sit here and writhe with guilt. As posted previously in this blog, I have a lot of shoes. Shoes of many colors. Not “designer” shoes, just comfortable, fun shoes and boots. If I like something, sometimes I get the same thing in two different colors. I save my shoes for years and years, which adds to the volume. I am pretty set for shoes, which adds to my angst this morning. There seems to be a bit of a trend – I am drawn to red shoes. I have red sandals, red flats, red slip on shoes and red cowgirl boots, so there is pretty much a red shoe available to be worn at any season. Although truth be told, the red sandals are over ten years old and slightly out of style, the red flats are shredded and have a hole in them, the red slip-on shoes make a really annoying squeak when you walk and bleed red dye when they get wet. The only really viable red shoes right now are the cowgirl boots. 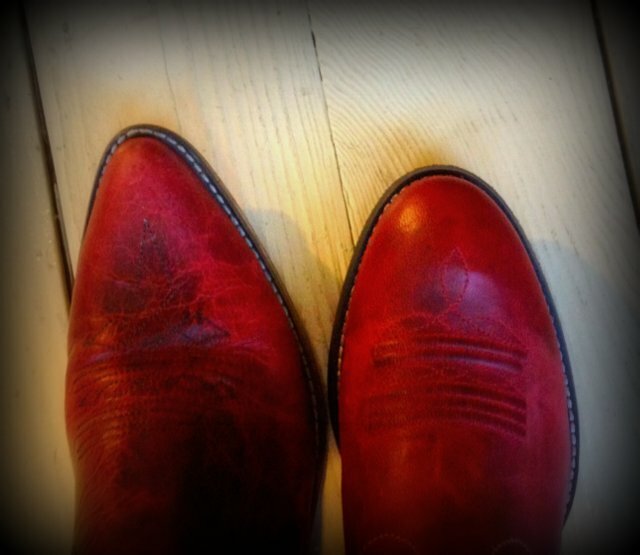 I have a serious thing for cowboy boots; I have four pairs at present – all different, but still four pairs…. which leads up to the psychic pain this morning. A few years ago for my birthday I was gifted this beautiful pair of red, ankle-height, pointy-toed cowgirl boots. They have tan heels and a bit of red stitching on them. I have worn them often enough that they are very comfortably broken in. I love wearing them, love to look at them, and I love thinking about my sister who bestowed them upon me. They are cool boots. They are lots of fun and go with much of what I tend to wear. I have mostly been blissfully happy with my boots….the only thing I wish that was different about them would be if they were a little less pointy. Back when I got them, there was not that option. They are similar in the shade of red as the boots I already have. But the cut at the top is different. The toe is definitely different – I like the rounder toe. The heels are black. They are a tiny bit clunkier and less stream-lined than my current beloved red cowgirl boots. They feel different but are comfortable, and fun. They present with a slightly different look, although I cannot articulate exactly what it is. The other thing about them is that I have this same pair in black/gray from a few years ago. I picked them up. Put them down. Tried them on. Then I tried on another pair of red shoes that were totally different, hoping they would pull me away from the redundancy I was on the verge of committing. But no, it was the red cowgirl boots. I sighed. I tried on a pair in tan. They didn’t cut it for me. I do not need this second pair of boots. Then I rationalized that I will now always have a pair of red cowgirl boots, with no worries about them ever wearing out. I rationalized that these particular cowgirl boots will look very nice with long pants, and that they are somewhat different. I rationalized that cowboy/cowgirl boots never really go out of style. Then I put them down. But then I picked them up again. As if magnetized, they slowly but steadily gravitated towards the register. Yes, I bought them. Yes, I really like them. I do feel excited about wearing them, when I decide to wear them. But right now I am afraid to wear them. I feel like a frivolous, disgusting American in a consumer-driven world of excess. The excess part of this sickens me. There was no need. I envision my frugal, practical mother shaking her head. They sit in the box. I take them out, put one on, put my other pointier red boot on the other foot, look at them both. Wrap them up and put them back in the box. If I don’t wear them outside, I still have the option of returning them. But I don’t want to return them. Or maybe I do. I am afraid if I do, I will be sorry. I realize in the scheme of the world that this is meaningless, vapid, spoiled-brat kind of stuff. I also realize that some people go out and drop big money on lots of shoes (and other things) without batting an eyelash. I am very aware that some people have no shoes and some people are starving. I am also struggling with the fact that I am now unemployed and have much more pressing things to do with my money. I know some people should be so lucky to have such a stupid problem. I realize if I keep these shoes, not only will I need to get good wear out of them to alleviate my guilt, but I will also need to balance that with my already beloved but pointy and slightly different red cowgirl boots in order to transcend the guilt. On some level I believe I am just thinking about this too much. It might be helpful if some other shoe-a-holics out there weighed in. This entry was posted in Fashion, Perspective, Regrets, Shoes, Shopping, Uncategorized and tagged excess consumerism, excess shoes, guilt, red boots, red cowboy boots, red cowgirl boots, red shoes, Shoe-a-holics, Too Many Shoes. Bookmark the permalink. Take it from the daughter (well, both daughters!) who inherited your love for shoes: KEEP THE BOOTS! When a pair of shoes make you as happy as these boots do, they are a pair of shoes worth keeping. I know you. You will dream about them and seriously regret your decision if you return them. Put on the new boots….don’t think, just walk outside…problem solved, again, don’t think. You deserve to have anything it is that you really want. You can never have too many pairs of red shoes. My favorite color is blue – but sometimes you just have to wear your red shoes. There is a reason. You can NEVER have a bad day when you are wearing red shoes. Life is too short! Wear the new red boots and enjoy every minute. My neighbor just went through a health crisis and then bought a little Mercedes convertible. He is enjoying every minute in it. And you should enjoy yours and throw out any shread of guilt. The boots are right! Wear them in good health! its ok to treat yourself nice!